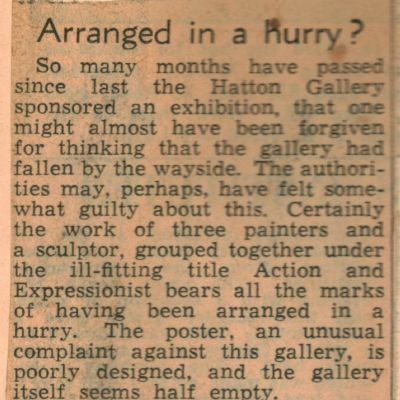 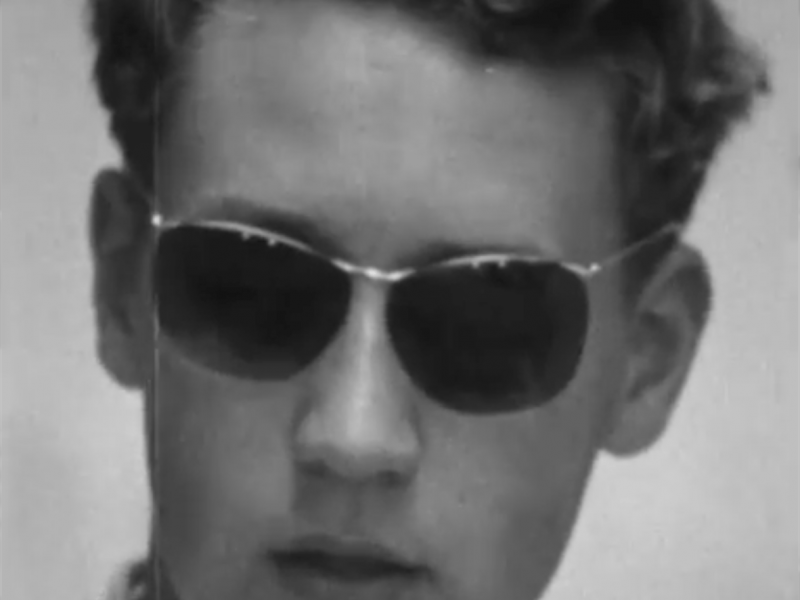 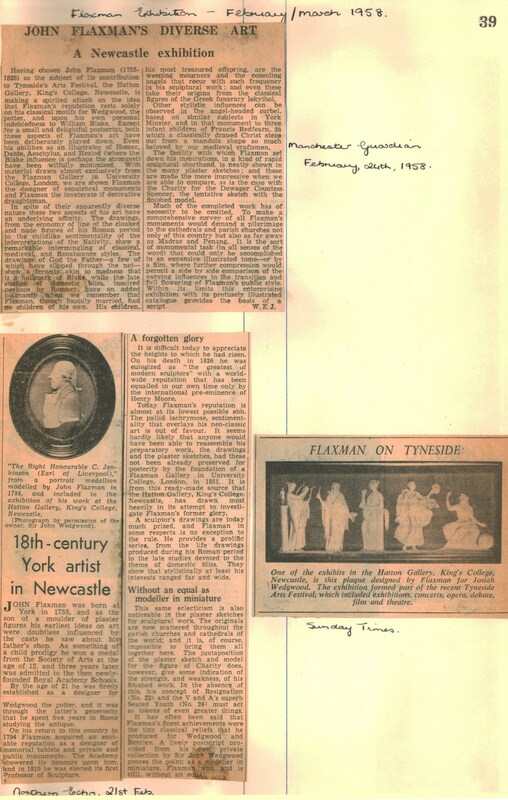 Filmed by student Michael Dawson towards the end of the term in 1958, this short piece of film really shows the fun and social side of life in the Fine Art Department at the time, with staff and students dancing and enjoying the music together on the Hatton Gallery’s roof and some orchestrated larking around in one of the Departmental studios. 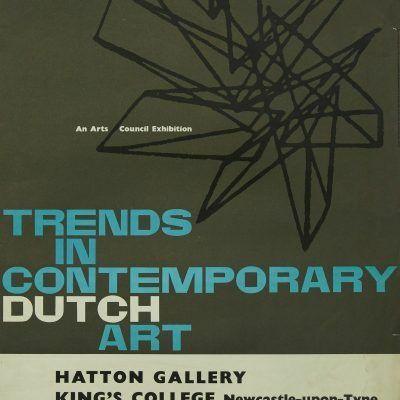 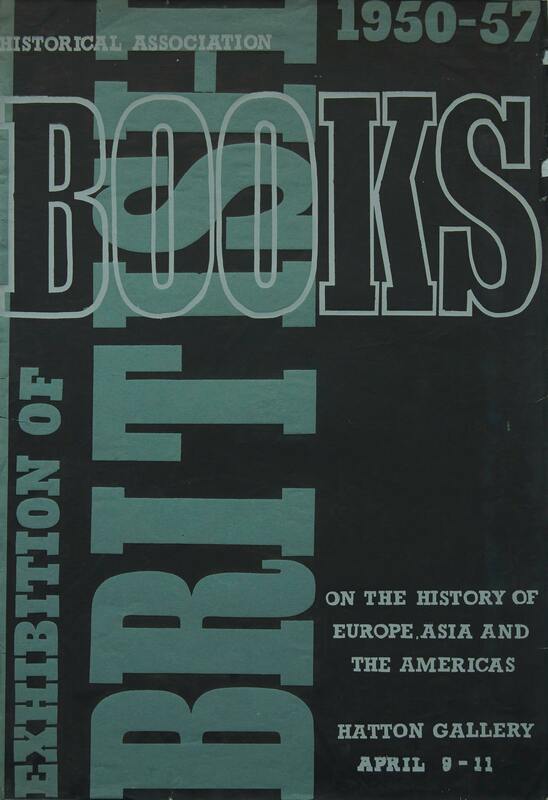 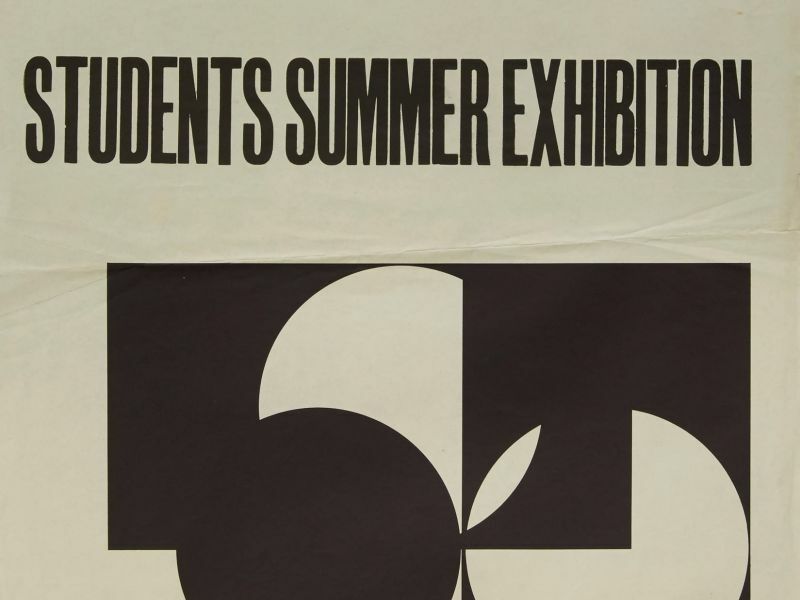 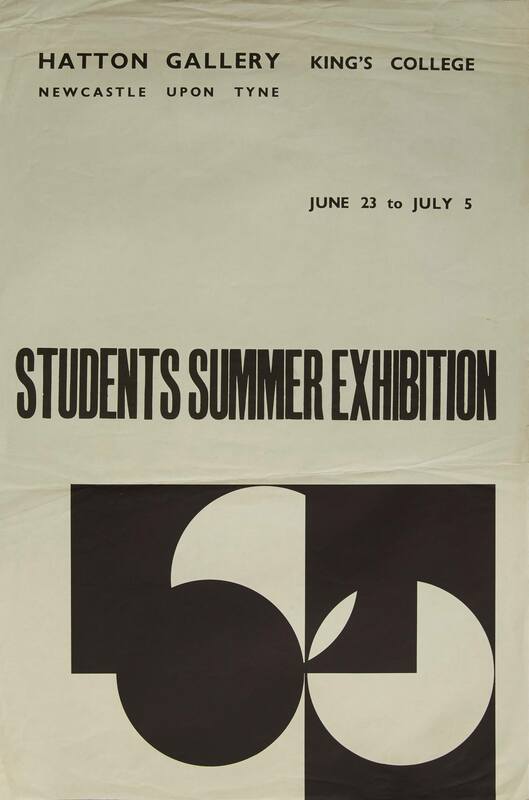 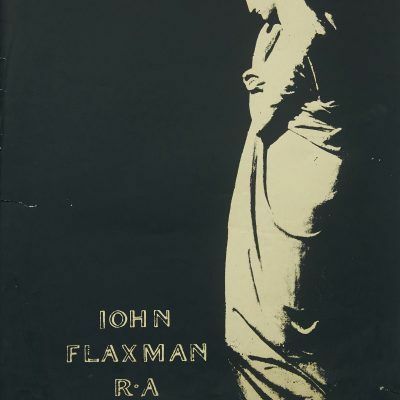 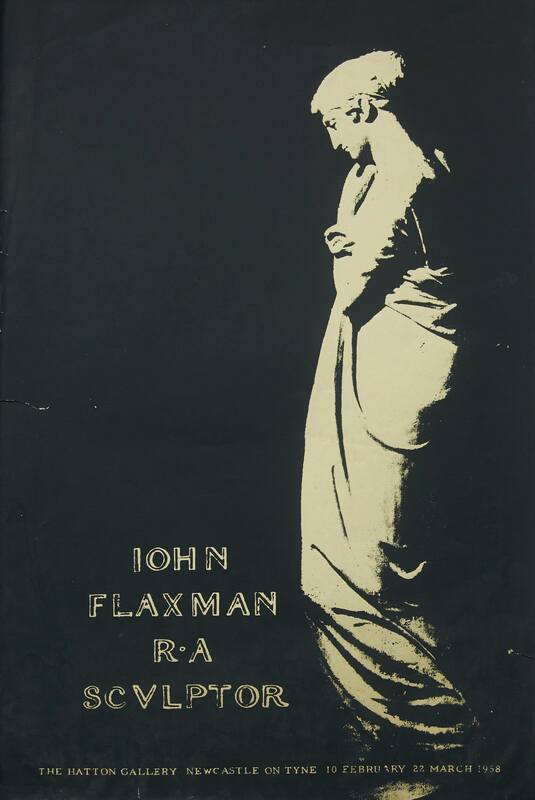 The 1958 Summer Exhibition poster, and the catalogue cover which used a detail from the poster, look very much like an example of a ‘basic course’ exercise looking at the relationships of simple shapes and contrasting use of black and white. 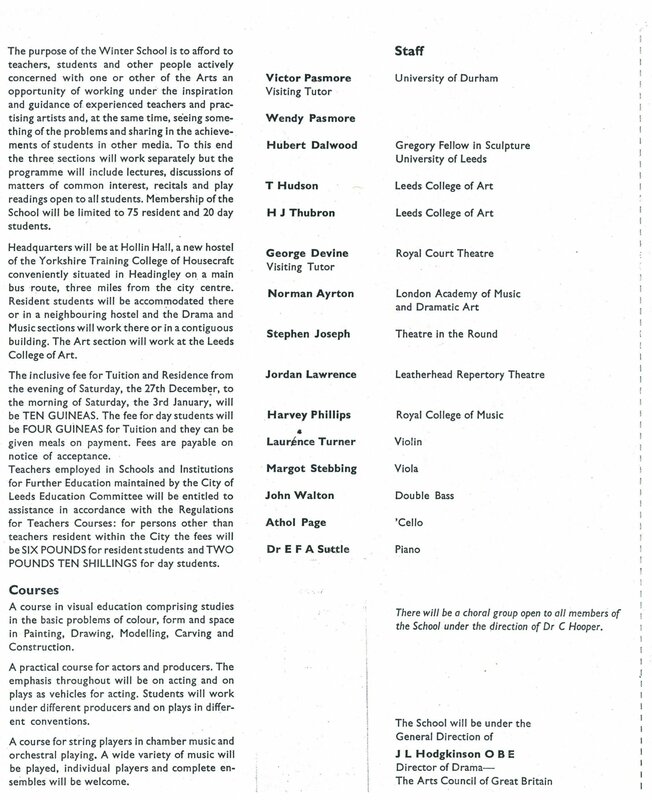 In 1958 the external examiners were Claude Rogers and Bernard Meadows. 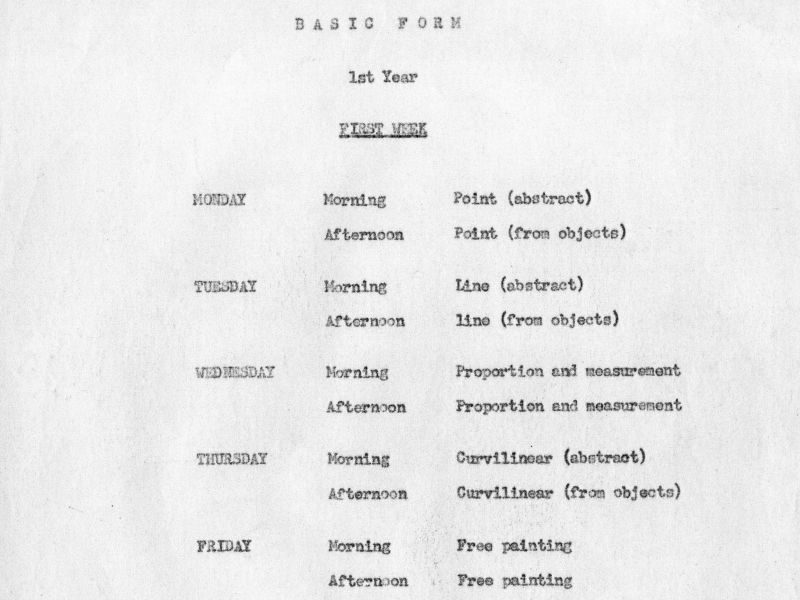 This simple outline for the first week of the first year gives an idea of the concepts of ‘basic form’ which new students would be introduced to from the very start of the course. 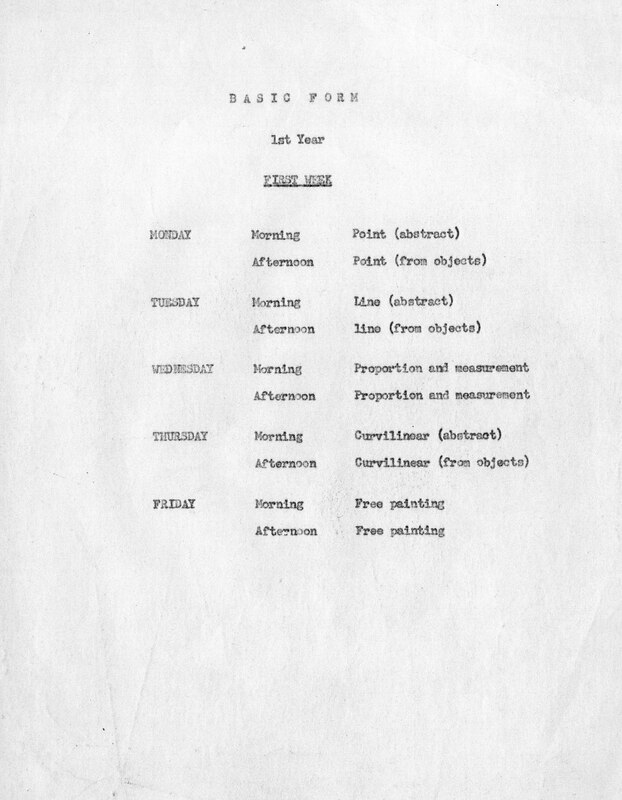 Student alumni Mary Webb (1958-63) and Rose Frain (1958-62) describe their introduction to the Basic Course. 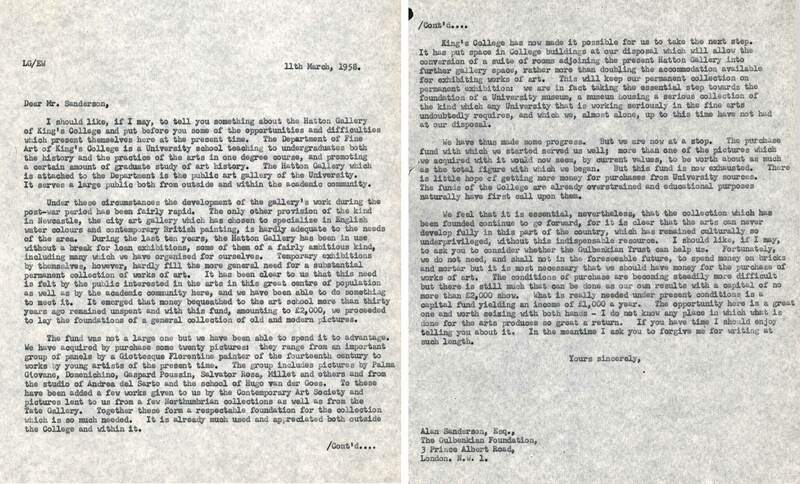 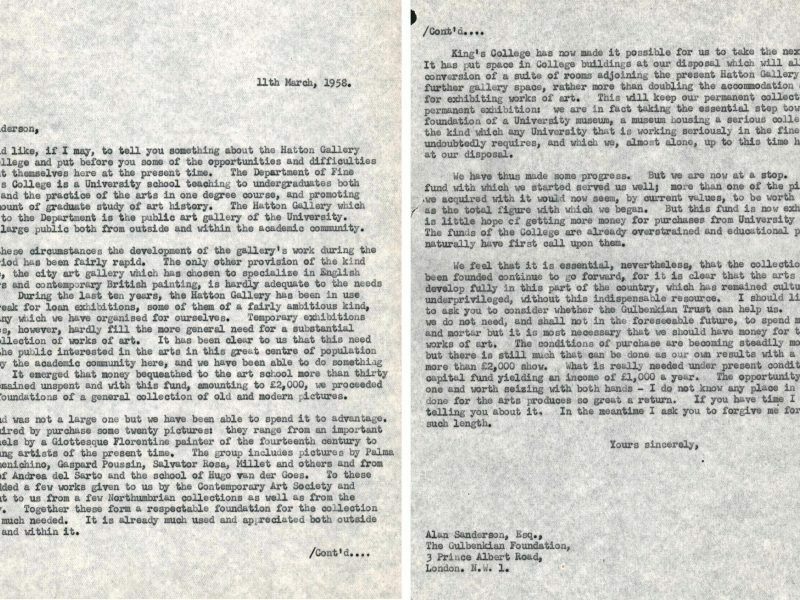 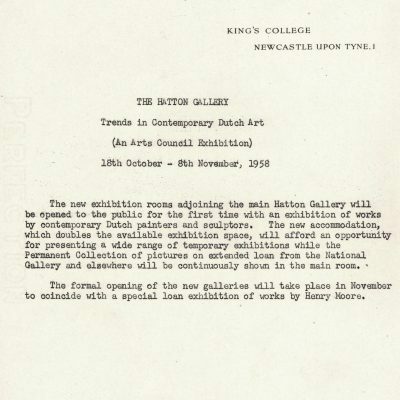 King’s College staff were involved though committees and as advisors in the wider cultural life of the region in a variety of ways. 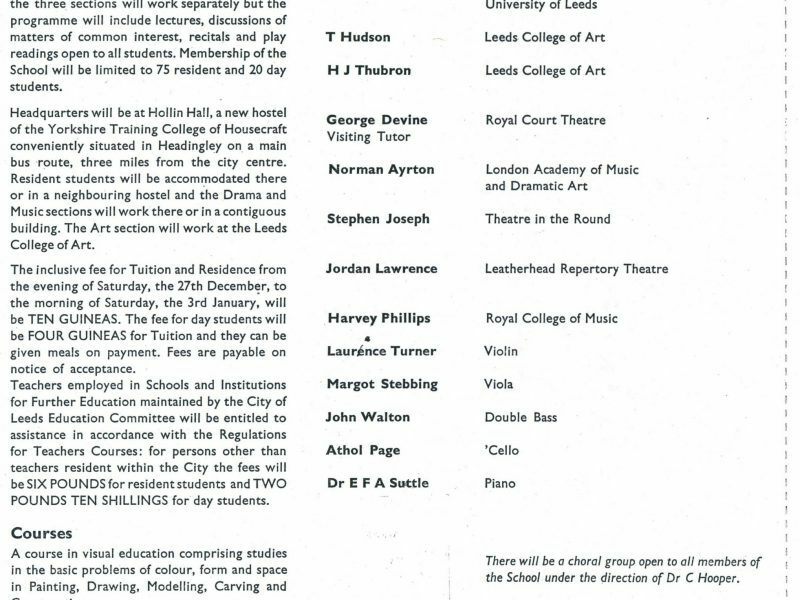 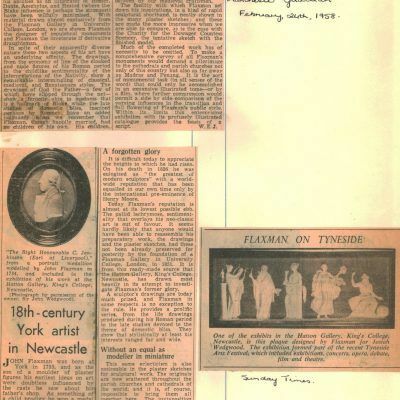 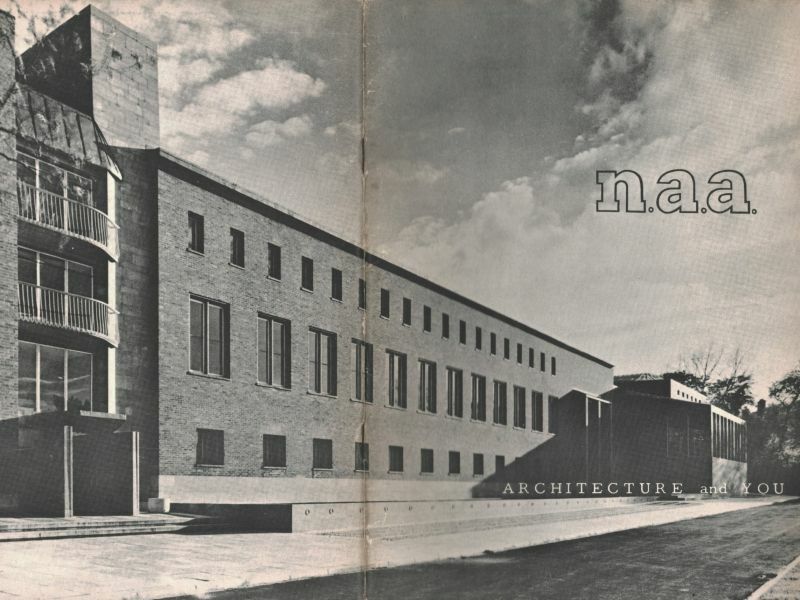 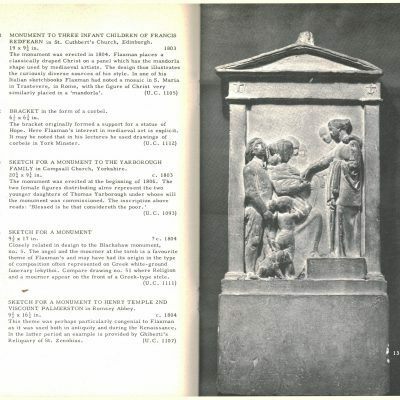 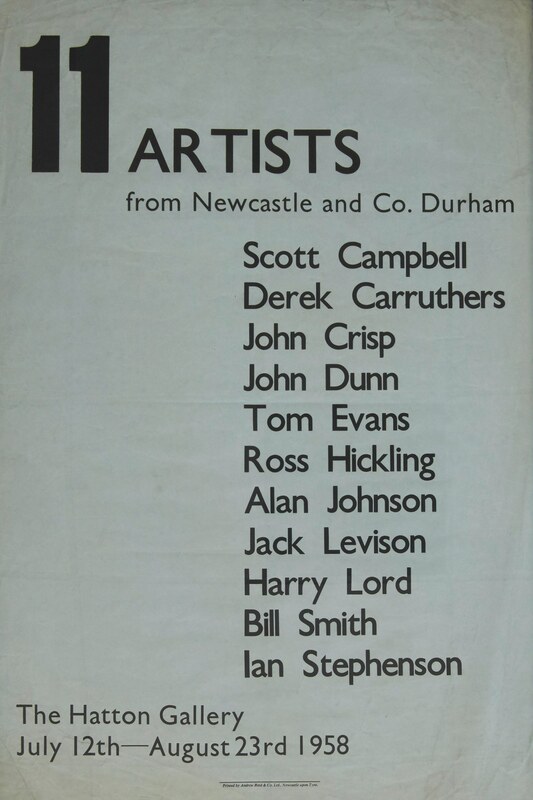 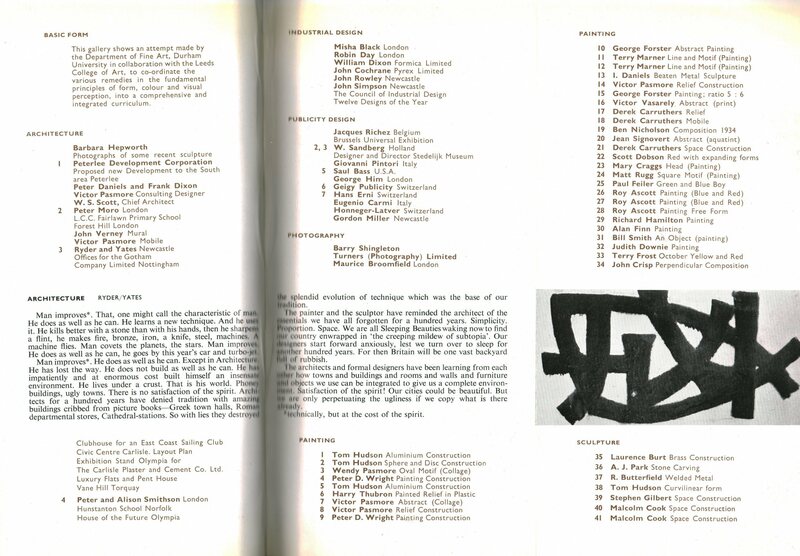 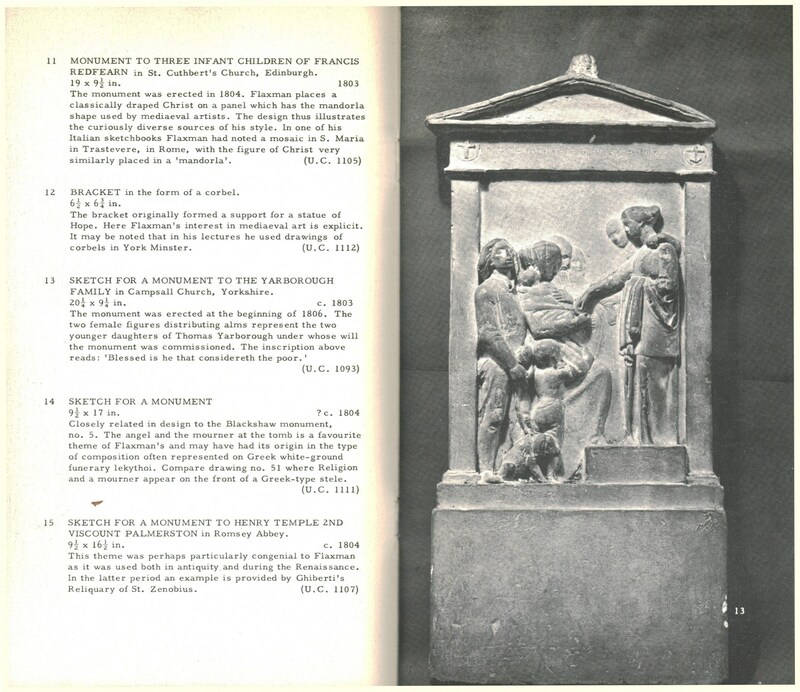 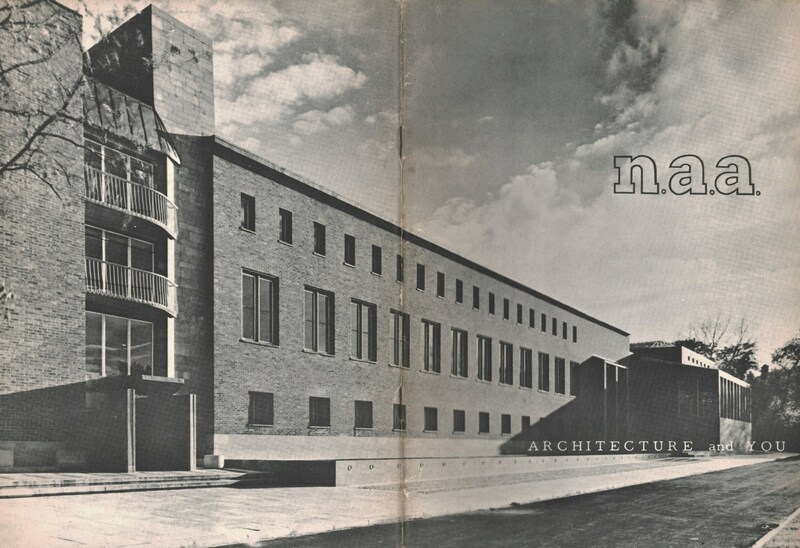 The catalogue for this Northern Architectural Association exhibition ‘Architecture and You’ at the Laing Art Gallery was produced at King’s College and the Committee was chaired by Professor of Architecture W.B Edwards. 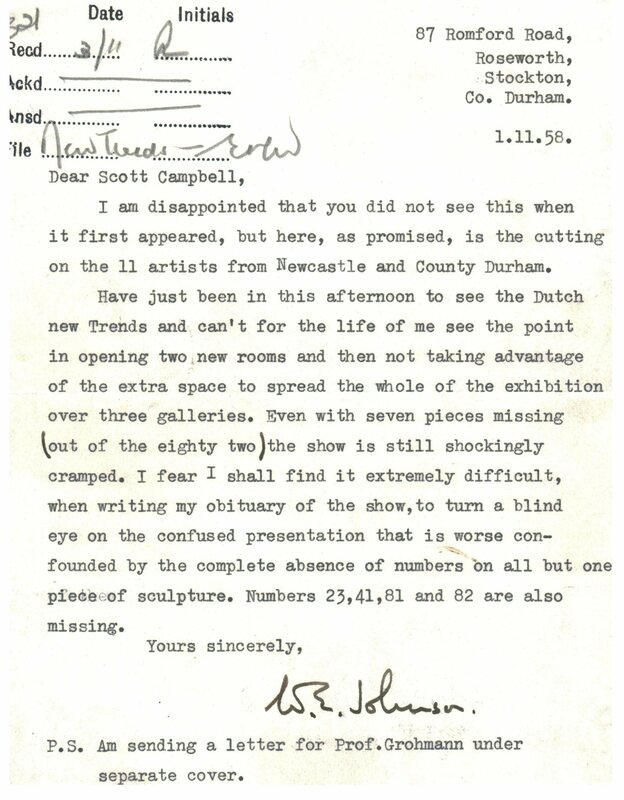 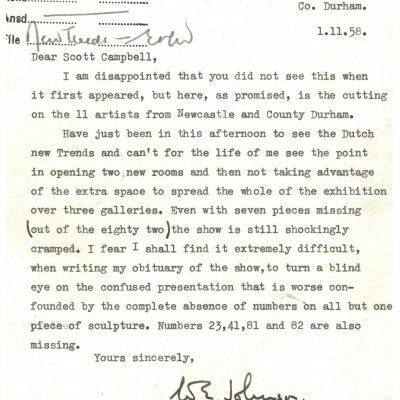 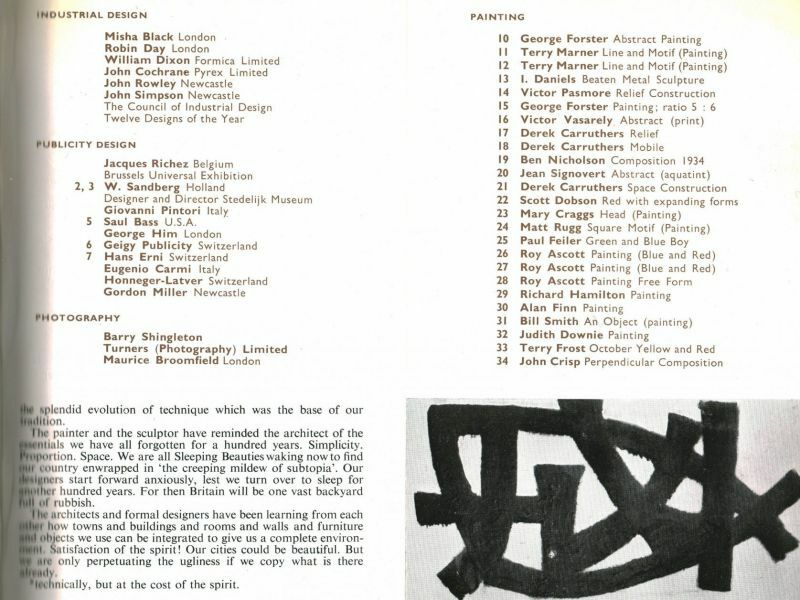 Fine Art staff Murray McCheyne, Geoffrey Dudley and Leonard Evetts are also thanked for their ‘generous assistance’. 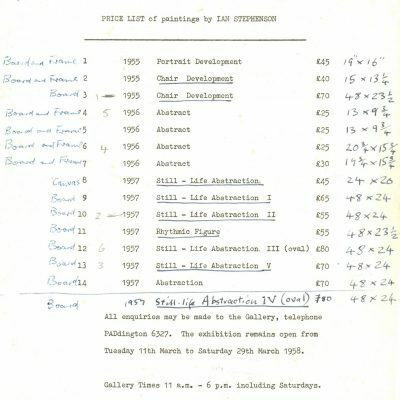 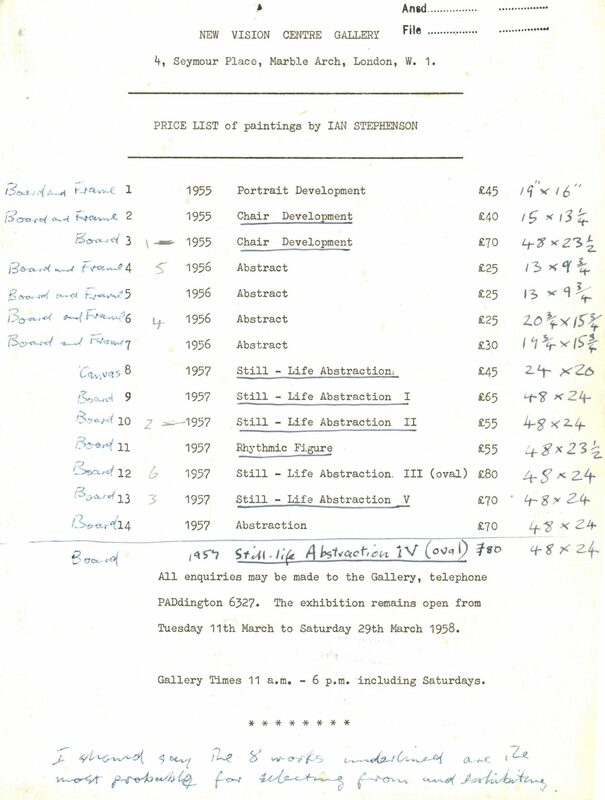 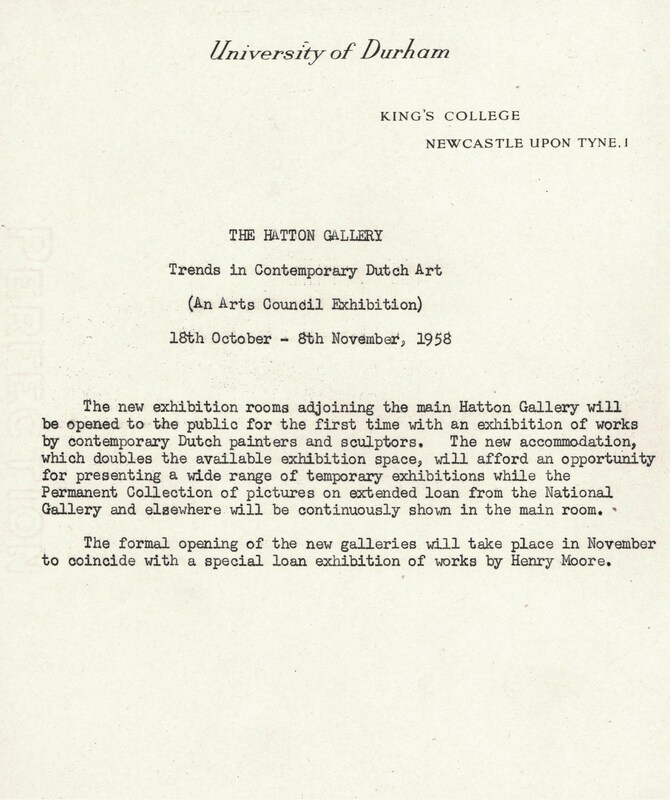 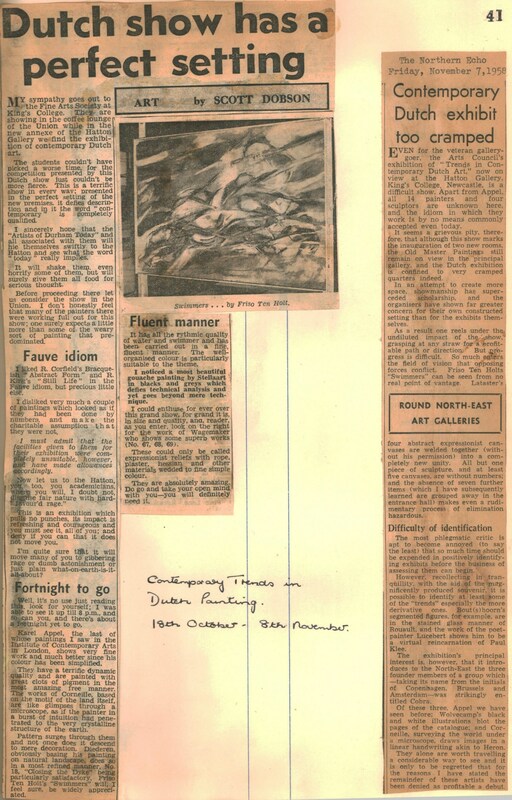 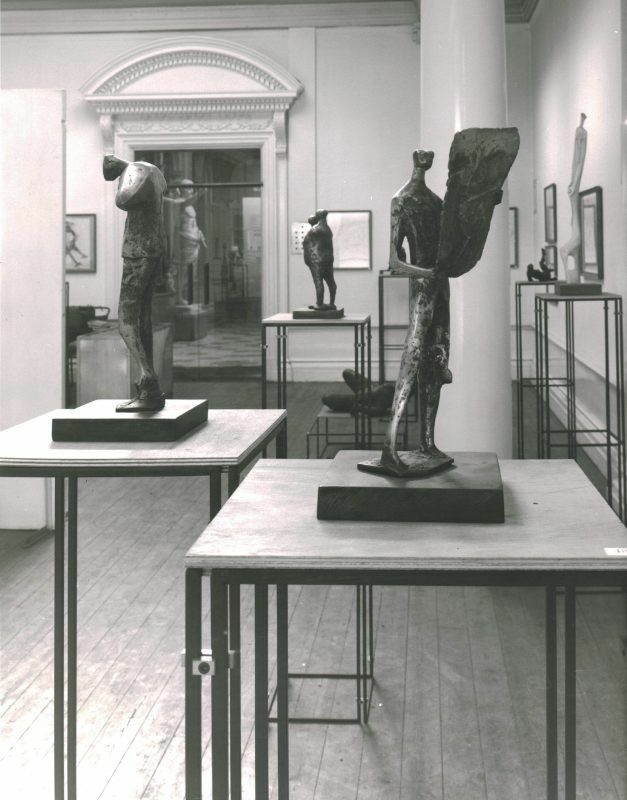 The private view card for Art, Machine and Environment indicates that Pasmore and Hamilton were the advisors to the organising committee, which included current students in the Fine Art Department Terry Marner and Roy Ascott. 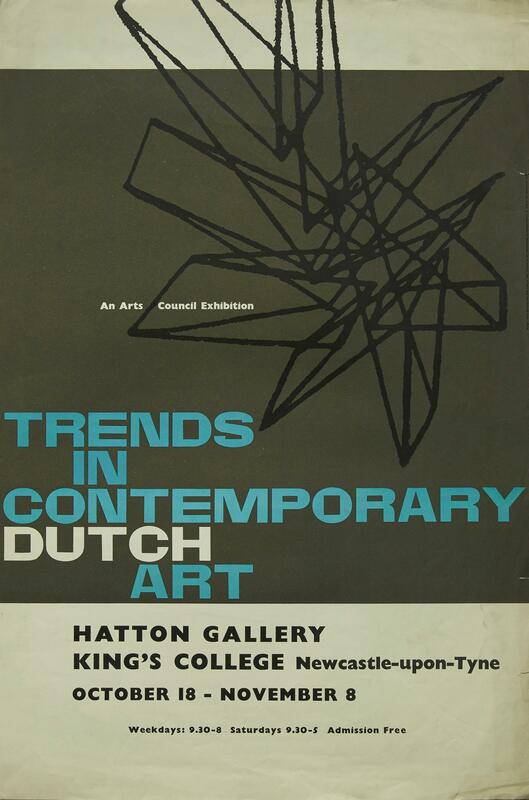 The Art, Machine and Environment exhibition held at the Laing Art Gallery was very much a product of the Fine Art Department at King’s College. 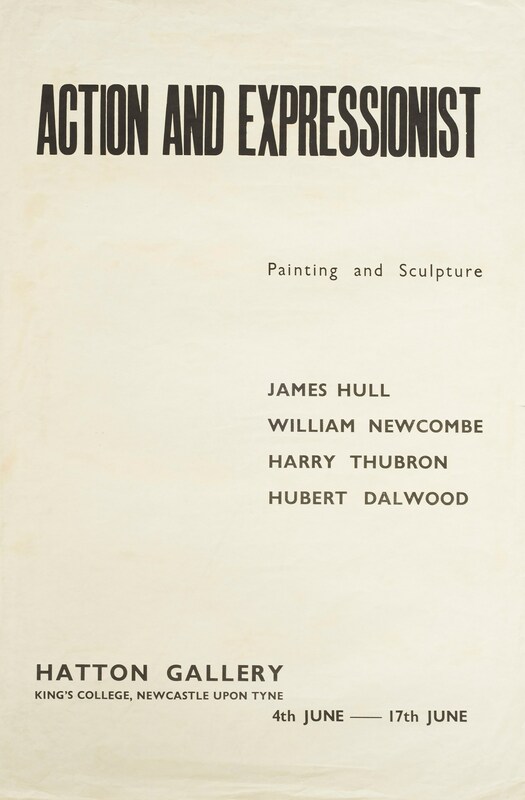 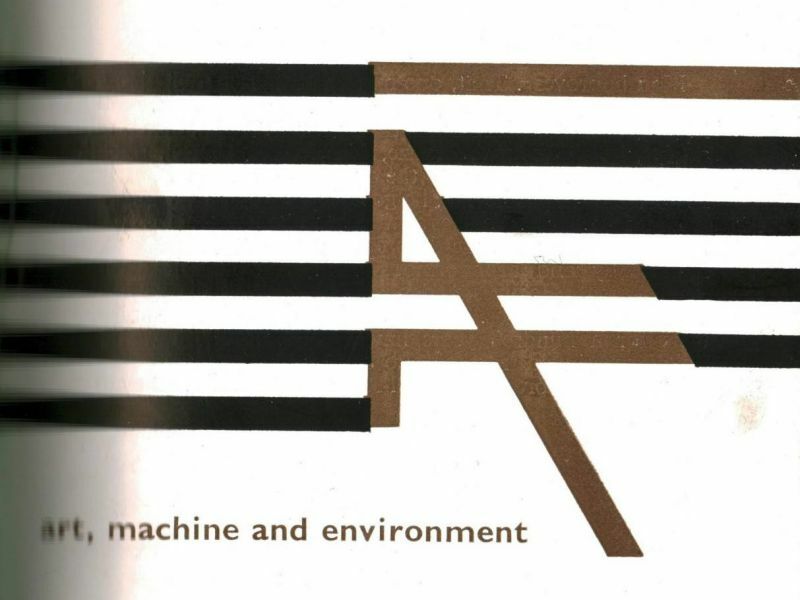 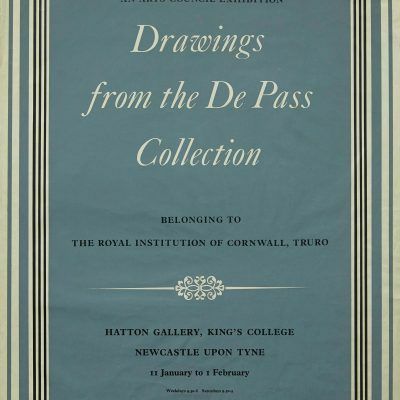 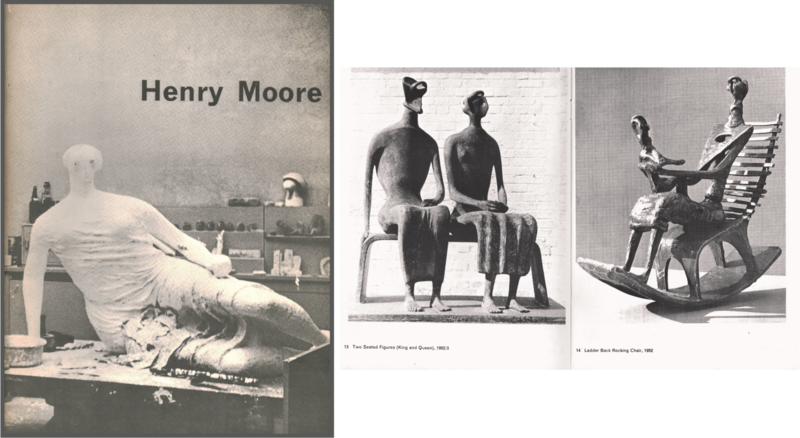 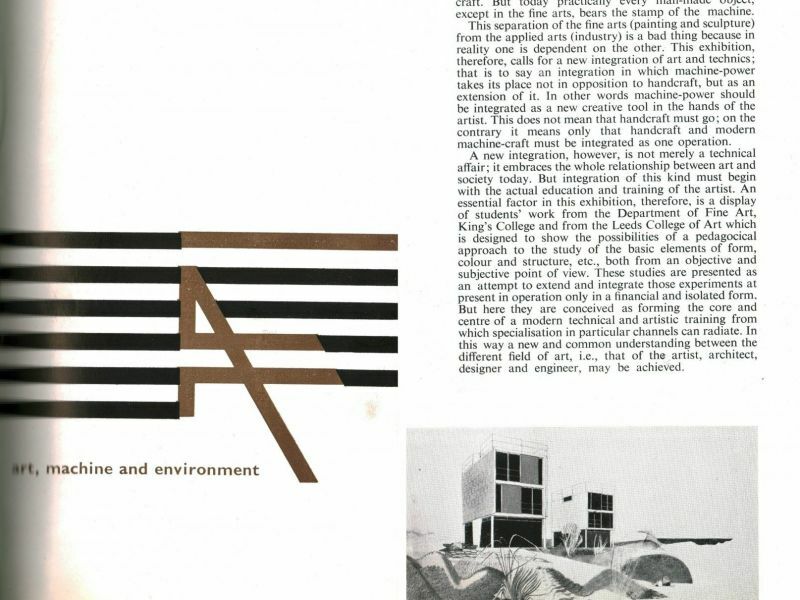 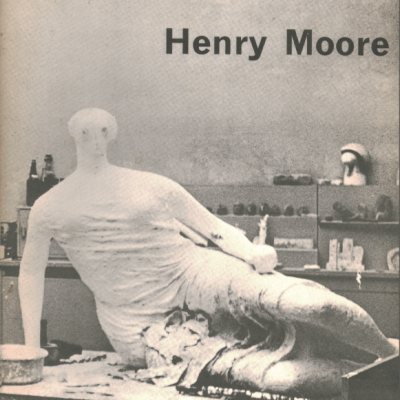 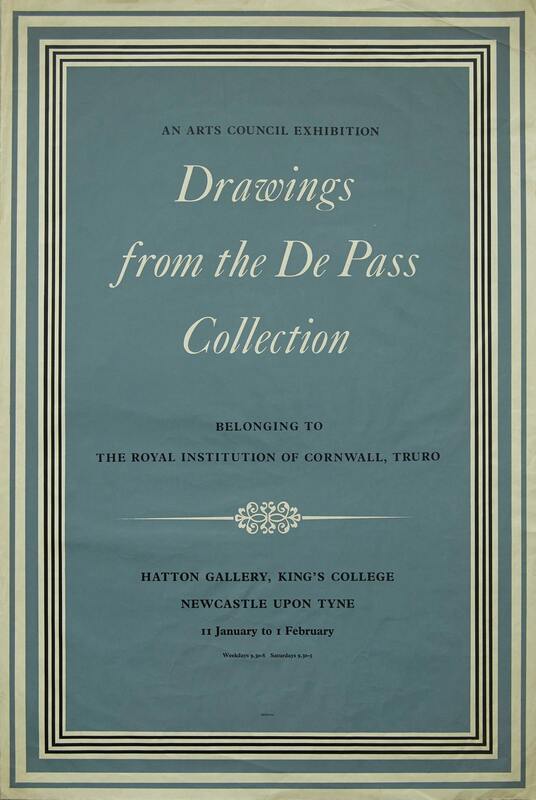 The catalogue featured a detailed ‘Forward’ from Pasmore where he calls for an integration of art, machine and handcrafts with society as a whole. 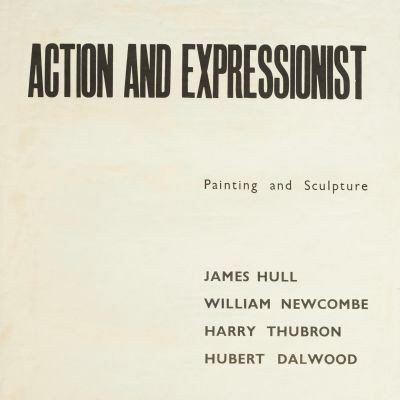 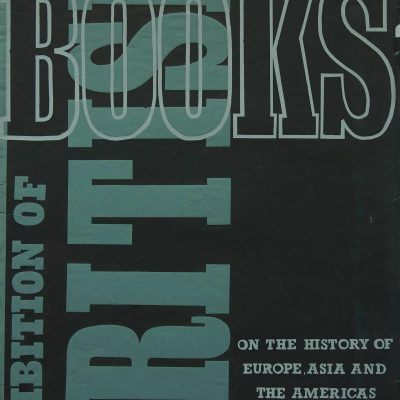 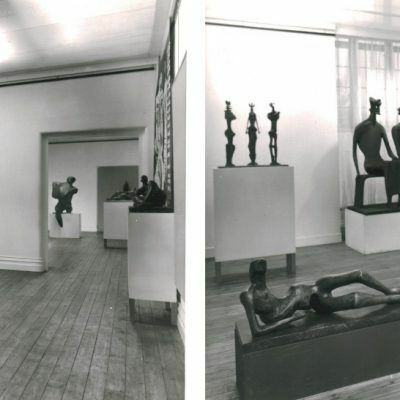 He identifies as central to this ‘new integration’ the education of artists through ‘a pedagogical approach to the study of the basic elements of form, colour, structure etc., from an objective and subjective point of view’. 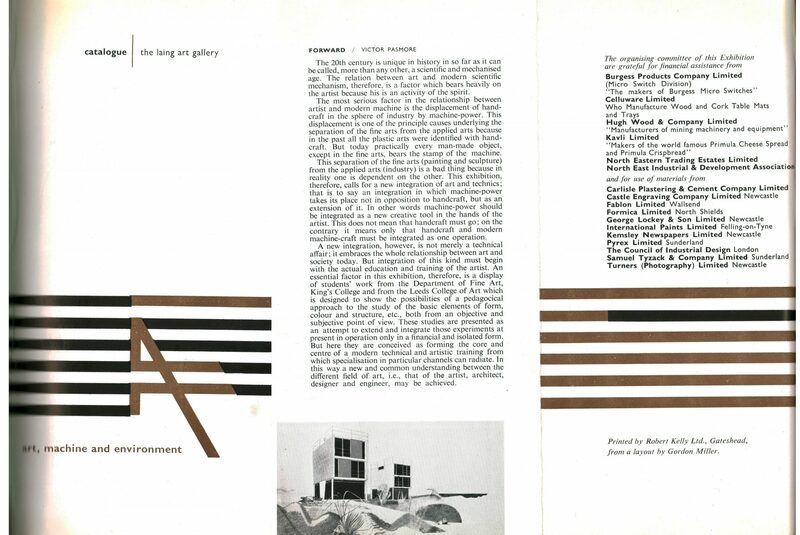 The catalogue list of works in Art, Machine and Environment reveals a fascinating range of new art, design and architecture, relating to Pasmore’s theme of ‘integration’ expressed both in his text and that of local Architectural firm Ryder & Yates. 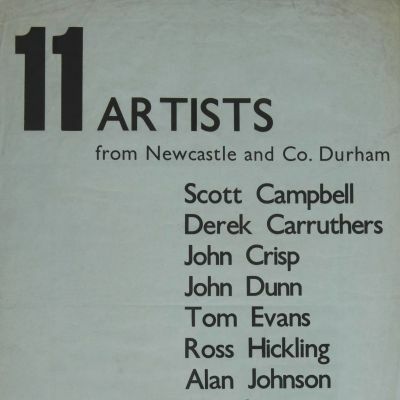 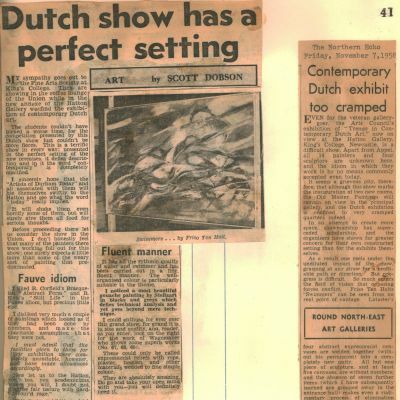 While many of the art examples come from the ‘centres’ of the ‘basic course’ – Newcastle and Leeds, the design pieces are drawn from an impressive range of national and international sources.